On Thursday, June 21st, at Gas Turbine Center we hosted the Media RoundTable about the future of Power technologies. Among guests there were representatives of the Ministry of Innovation&Technology and Polish authorities of GE: Marian Lubieniecki – Chairman of the Board General Electric Company Polska, Managing Director GE Engineering Design Center, Sławomir Żygowski – President of GE Power in Poland and Michał Małecki – GE Power Executive Manager at EDC. 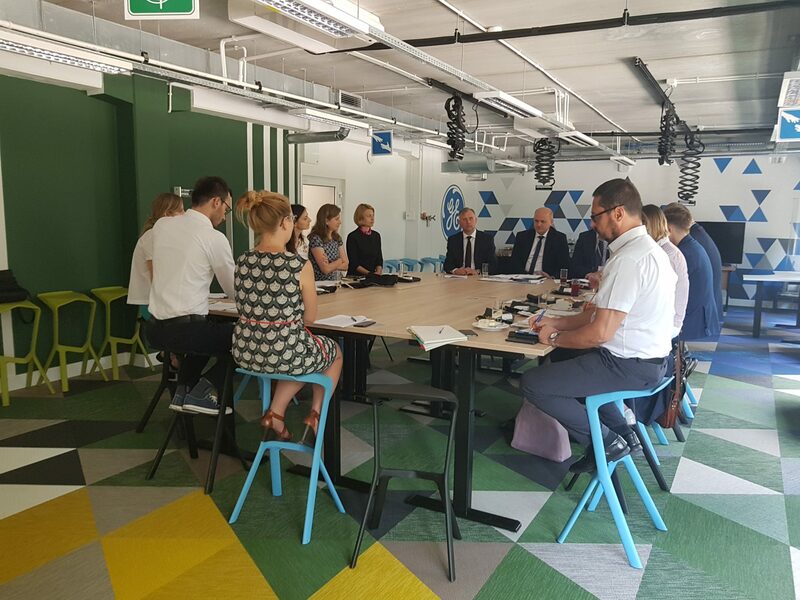 During that special meeting that took place in the unique Innovation Room, a group of journalists associated with the industry asked their questions and listened to a discussion led by the GE and Ministry experts, about the future of the Energy market. Among others, our guests talked about ways of making power energy generation system more flexible and wondered how the Polish energy mix will look like in 2030. A lot was said also about the digitalization of the Power industry. Representatives of the Ministry underlined the strong role of EDC in the process. They expect that GE will support Polish economy in the development of the Power technologies. And that is happening. “As a part of GE, we are automatizing our processes and implementing predictive maintenance to our services. Thanks to innovation and digitalization we improved the efficiency of GE power plants.” – said Marian Lubieniecki during the meeting. Michał Małecki emphasized also the role of Predix platform in the process. “By monitoring and analyzing data from more than 10,000 sensor inputs across the plant, operators are able to make smarter decisions about how to optimally run their power plants for better performance and increased flexibility at lower cost.” – said the GE Power Executive Manager at EDC. These solutions can increase efficiency up to 1.5% over the life of the plant, reduce CO2emissions by 3%, and allow for 5% less unplanned downtime. “Innovation heart is located at EDC. And it beats strong.” – said Sławomir Żygowski, President of GE Power in Poland. The proves of that the journalists could have seen just a moment after the RoundTable discussion, when they visited some of the GE Power Labs. Our guests saw that what they heard about innovation at EDC is really happening every minute.